Alluding to continuous US sanctions on Iran and the new decisions of the US about Iran, Shaikh Abdol-Hamid urged on focusing on two pivots of “Allah” and “people” as well “deep reformations in policies” as the best ways to resist against the sanctions and problems. “I think we should not pay much attention to these sanctions, instead of it, if we focus on two pivots of Allah and people, all problems will be resolved. First of all we should examine our relation with the Almighty and reform it and secondly voice of people should be heard and their demands should be focused on and brought up to acts,” he underlined. “I do not see any discretion and tactic to cope with the sanctions better than reforming our relations with Allah and the nation. We should obey the orders of Allah and people’s demands, however they are against our wishes,” he added more. Donations were collected by the order of Shaikh Abdol-Hamid for the victims of flood in Lorestan and Khuzestan provinces. In the first part of his Friday sermon, Shaikh Abdol-Hamid urged on “repentance” in the current circumstances and began his speech by recitation of the 24-25 verses of the Noble Qur’an, chapter Anfal. “The nations who disobey Allah will be defeated due to ignoring the orders of Allah and His last messenger. The companions of the prophet PBUH used to obey him always in every condition, that’s why they could defeat an equipped and strong army in the battle of Badr and other battles. 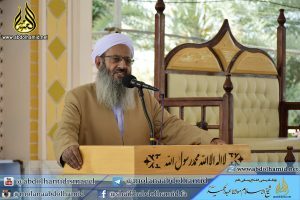 The army of Muslims was equipped well with the obedience and submission before Allah,” president of Darululoom Zahedan said. “Misdeeds and sins make people distressed and forlorn. The prophet Adam was ousted from the Paradise because of one obedience and then his repentance was accepted. The prophet Moses struck a man with his fist without intention of killing him; then he had to wander for ten years. These were prophets, we should be more careful and take lesson from them,” Maulana Abdol-Hamid concluded his points.